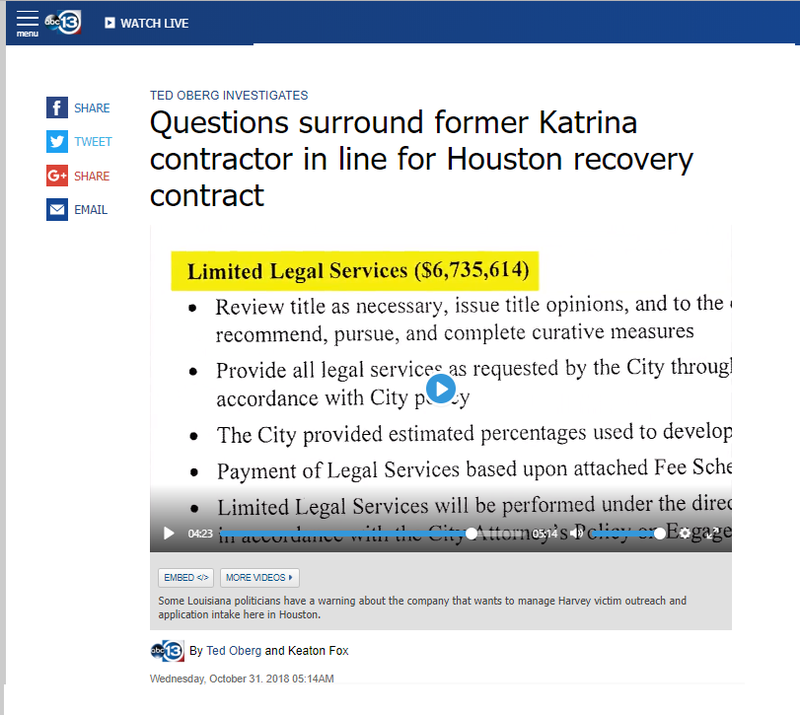 If you have not watched Ted Oberg’s story on the $35 million contract for Harvey “outreach services” Sylvester Turner is asking Council to approve, please go right now and watch it (click on image below). If you are like me, you will probably feel like you need to take a shower afterward. The contract is for “outreach, intake and case management services” related to potential applicants for the federal housing disaster money that is supposed to start showing up in Houston in the near future. $35 million is a lot of outreach, intake and case management. The contract is with a company named ICF, which specializes in disaster recovery services but has a spotty reputation. The company has been sued for over $200 million by the State of Louisiana for work it did after Hurricane Katrina and, according to the Times Picayune, was banned from doing business in Louisiana. This proposed contract stinks in so many ways it is hard to know where to start. But where the stink is the worst is in the involvement of Turner’s former law partner, Barry Barnes. Amazingly, out of the roughly 60,000 lawyers in Harris County, ICF just happened to choose Turner’s former lawyer to handle the legal work relating to the outreach program. I am not exactly sure what legal work would be needed to do outreach to flood victims, but it is hard to imagine it would be very extensive. The original materials submitted to the City Council’s Housing Committee indicated that Barnes was to perform “limited legal services” for fees “to be determined.” On two occasions during the hearing, the Housing Department staff assured the Committee that Barnes was providing “limited legal services.” [click here to see presentation to Committee], see note on page 4. But according to Oberg, there was a proposed contract with Barnes that would pay him a whopping $2.7 million. That is shocking enough, but incredibly by the time the proposal got to City Council, Oberg says Barnes’ proposed fees had grown to over $6.7 million. Why on earth would you need $6.7 million of legal services for what is basically a program to identify and help people fill out grant application forms? At the Housing Committee hearing, ICF’s proposed price was $27 million. But by the time the request got to City Council the cost had increased to nearly $35 million. [click to see Council agenda backup] Does anyone believe that the dramatic increase in Barnes’ fees was unrelated to ICF jacking up its price to the City? Turner claims that he had nothing to do with the procurement process and it was just happenstance that his former law partner was selected by ICF to be paid $6.7 million for providing “limited legal services.” Right. A few other facts about the proposal you need to know: The Housing Department admitted ICF was not the low bidder. There was no bid process to select the subcontractors. 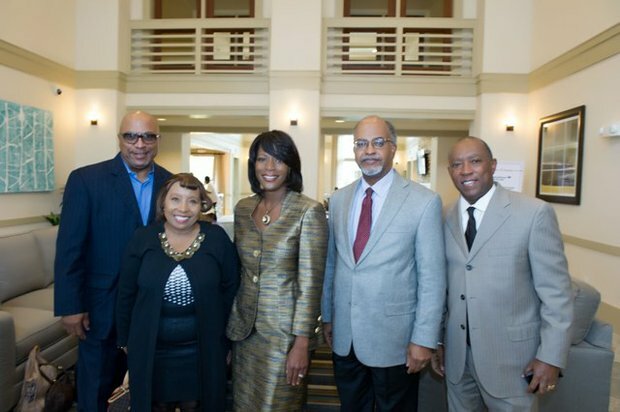 And, of course, several of the subcontractors have dutifully made large campaign contributions to Turner and other members of City Council. The City of Houston expects to receive over a billion dollars of federal aid for Harvey disaster recovery over the next several years. This is hardly an auspicious start. If the very first contract out of the blocks lines the pockets of Turner’s former law partner with $6.7 million in legal fees, one can only assume that graft will be endemic in the administration of the balance of the billion dollars of flood relief. No wonder state and federal authorities are questioning the City’s ability to administer such a massive program competently and without wholesale corruption. This has got to make them even more reluctant to turn over disaster money to the City. Folks, this out of control. This is the worst corruption I have seen in over 40 years of watching City Hall. But what makes this particularly disgusting is that it is being done at the expense of thousands who are still suffering from Harvey. How many families’ homes could be repaired for $6.7 million? How can anyone on City Council vote for this abomination and ever look at themselves in a mirror again . . . or in the eyes of one of their Harvey-affected constituents still waiting on help? I don’t ask you to do this often, but please forward this post to everyone in your address book and post on your social medias. Oberg did a great job digging this out. We need to make sure everyone in the City knows about this travesty. No surprise here! Corruption everywhere!